The Imperial Houses of the Diet in Tokyo. The Imperial Diet established by the Meiji constitution in 1889 was Japan’s first modern legislature. It consisted of a House of Representatives, directly elected, and a House of Peers, consisting of high ranking nobles. The Imperial Diet Building was constructed in Hibiya Uchisaiwaicho. Soon after its completion, it burned down. 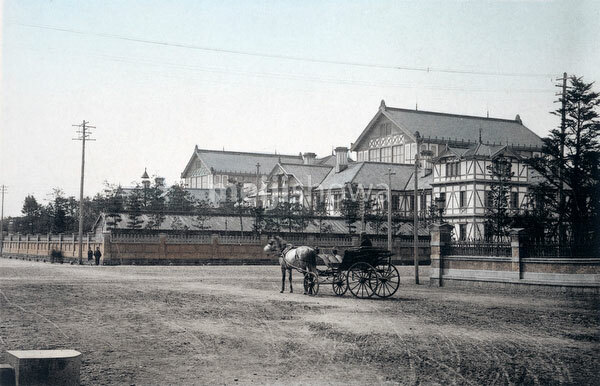 The second building, pictured here, was erected at the same location, but it burnt down in 1925 (Taisho 14). The third temporary Diet building was completed in December of that year. It was used until the current National Diet Building was completed in November 1936.